The Wanstead Society has scored a historic victory in its long-running struggle to prevent development on the Evergreen Field on Wanstead High Street.Â Or, perhaps, they haven’t. Councillors on the Redbridge regional planning committee approved the plan at a meeting at Wanstead Church School on Wednesday night, sparking several celebratory tweets. So does that mean an end to the plans, recapped in full here in the first instalment of Tales from Evergreen Field, for flats, shops, mosques, vegetable patches, luxury apartments or starter homes? Err… no. 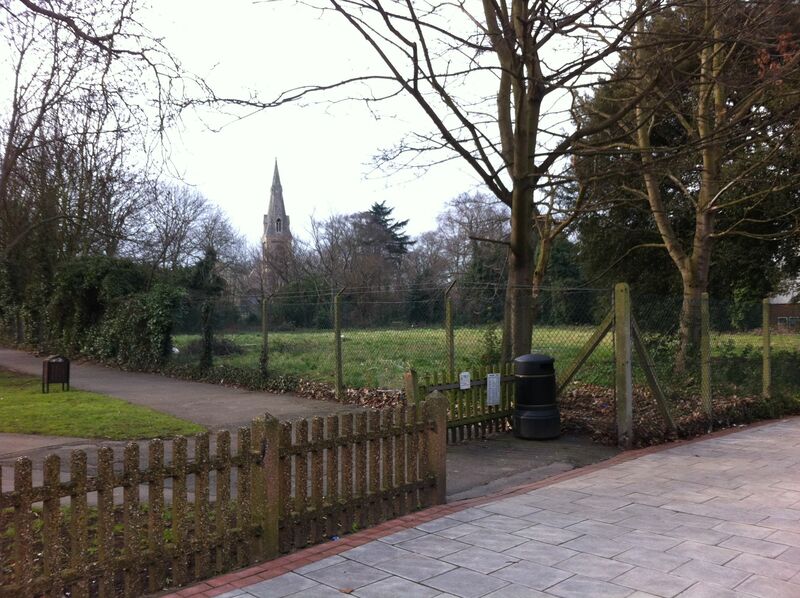 Not necessarily, for one very obvious reason: the Wanstead Society doesn’t own the land. So what exactly was the point of the meeting, and what does the decision really mean? Wansteadium will be seeking further clarification about what, if anything, this decision changes, and we’ll bring it to you here. There is now a planning permission for multi-use open space on Evergreen FieldÂ – the first time it has ever had an approved use. This establishes the principleÂ of a suitable use for land that has lain vacant and useless for years â€“ but whoseÂ openness is an essential part of the Wanstead scenery. Rather than waiting for the worst and reacting against unsuitable development,Â the Wanstead Society proactively followed its vision. â€˜We donâ€™t own the land, butÂ we feel the land belongs to Wansteadâ€™, say the Society. After years of limbo, weÂ want the community to shape its future. The planning application raised awareness of the field and caught peopleâ€™sÂ imagination â€“ there have been a variety of views about how it should be used.Â The permission sets a new baseline for the ownerâ€™s proposals â€“ it means anyÂ alternative development will get intense scrutiny. It is the first time there has been an intelligent response to the Councilâ€™s planningÂ policy to protect the open space. This policy has existed for several years, yet theÂ long term owner did not address the policy andÂ sold the land to a new buyer, despite its statutory policy againstÂ development. The Society now has to carefully consider ways forward. It has to define aÂ practicable use, set how the land would be brought into use and how it wouldÂ be managed in the long term. This has to be done in a creative, realistic andÂ collaborative way â€“ hopefully with the Wanstead-based owner, but also withÂ local organisations and councilors. What are the views of the owner? The present owner bought the site for Â£250,000, less than the price of a 2 bedroomed house in Wanstead. Couldn’t the Council have bought it for that to ensure it’s protection? In these austere times, I doubt the council has sufficient money to buy the land. However, I’d be surprised if the land is worth 250k or anything near that without planning permission for houses/flats. Perhaps the residents of Wanstead could raise some money and make the owner an offer. Surely it’s of little use to him/her as it is. …and you also meant “to ensure its protection”. I was at the meeting. Utterly pointless. They might as well propose that they put a rollercoaster on the site. Maypole dancing? Snowcrowd? It’s 2013. I am trying make the two parties see a third way. Maybe we need to bold as a community and buy it for ourselves? Then we truly get decide what this potentially amazing space . In the highly unlikely event that houses were approved on the site, it would be a prime location and I doubt they would be considered affordable. But with the planning permission approved in favour of The Wanstead Society, the price of a house is more academic than the society’s plans. The only way forward is for the people of Wanstead to raise the money to buy it for community use. How do we go about making a pledge? Is the Wanstead Society organising this? What we need is a price agreed and a big thermometer on the high street to colour in! Given the new and annoying parking restrictions in the area perhaps the Evergreen Field would make a great car park? A real community asset.